This major award in the field of atmospheric science honors Held for his four decade career at NOAA’s Geophysical Fluid Dynamics Laboratory in Princeton, New Jersey, as one of the major thinkers, writers and teachers in his field. Born in a refugee camp in Ulm, Germany just after World War II, Held emigrated with his parents to the United States at the age of four in 1952. He grew up in St. Paul, Minnesota, where his father worked as a meat-packer and his mother as a seamstress. From early on, his parents encouraged him and his brother to excel in their schoolwork. Asked how he first became interested in science, he recalled that at a young age, “I was interested in mathematics and I was also good at it.” This led him to the study of physics in college. But in the course of graduate studies during the turbulent 1960s, he made a major decision to shift his work from solely traditional physics to physics that would help explain Earth’s changing climate. Over the last decades, Held has explored the fundamental questions of how our climate works from tropical atmospheric patterns that control the boundaries of the Saharan desert to the factors that determine the path of the jet stream as it flows from west to east around the planet. 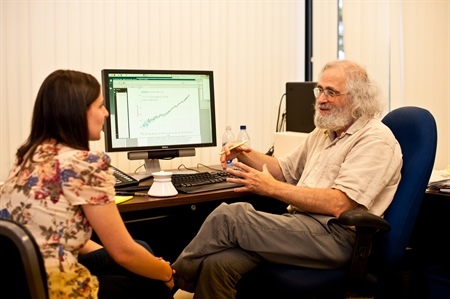 His work has been crucial to deciphering the major tropical circulations and climate patterns and their impact on North American and European climates. The earth system models he has helped build at NOAA GFDL have helped inform climate predictions that are at the basis of international agreements and negotiations. Held’s scientific achievements have earned him many distinctions. In 2003, he was elected to the United States National Academy of Sciences. He is a Fellow of both the American Meteorological Society and the American Geophysical Union. He has also received the Meisinger Award, the Carl-Gustaf Rossby Research Medal (both from the American Meteorological Society), the BBVA Foundation Frontiers of Knowledge Award for Climate Change, and numerous other awards, including two Department of Commerce Gold Medals and a NOAA Distinguished Presidential Rank Award. Held has authored 190 peer-reviewed papers, spanning atmospheric dynamics, circulation, and climate. Held has also helped inspire the next generation of atmospheric scientists as a lecturer with the rank of professor in the Atmospheric and Oceanic Sciences Program, a collaborative graduate program between NOAA GFDL and Princeton University. He also created a blog that has a devoted following among students and scientists worldwide. He uses the blog to discuss some of the most pressing questions about our changing climate and to describe elegant models for prediction.